Neither of us slept particularly well last night, and today started out with us tired and uncomfortable after a night of tossing and turning. We’d set the alarm for 7AM so we could get out and acquire insurance before we needed to check-out, and that turned out to be perfect, because by 7:05AM, the hotel was full of noise; people talking, laughing and generally having a good time in the dining area just around the corner from our room. Even with the “windows” closed, it was loud. We couldn’t have slept any later if we wanted to. We decided to pack our stuff so it was ready to put on the bikes when we returned, and then head out in a cab armed with the addresses of three potential insurance places. After yesterday’s disastrous search and playing “follow the cab” in the middle of Bogota, neither of us wanted to repeat that, so we thought it’d be safer to do our searching from *inside* the cab. Asked when check-out time was on our way out to hail a cab, and the guy at the desk told us 2PM. We understood, but Kay had a hard time believing it was 2PM as most places we’ve stayed have check-out between 10-12, so the guy eventually had to write it down before we’d believe it. Walked out the front door of our hotel armed with our bike paperwork and hailed a cab instantly. Kay walked to the street and stuck his arm out and BAM! There was a cab. Kay showed the cab driver the address of the most-likely insurance company; Seguros Suramericana* – because it was a major headquarters on the 16th floor of a building, and while we had no verification that it was there after 2008 (the most recent post on Horizons Unlimited), it seemed unlikely that a major insurance company would move out of a skyscraper office. It also opened at 7:30AM, and as it was now 8:20AM, this played a role in where we’d go. The cabbie knew the address and indicated he could take us there, and that the cost would depend on traffic and how slow we had to go. We got in, and had a pleasant commute through rush-hour traffic in Bogota as the cabbie was listening to classical music. Classical has a surprising impact on rush hour. It makes traffic much less stressful and driving in rush hour unexpectedly enjoyable. We attempted to ask the cabbie a couple of times who was the composer, but we got out of him that it was a 17th or 18th century composer – definitely not Vivaldi. The cab delivered us right to the skyscraper, which we were awed to discover was just a few blocks from the face of the mountains themselves. 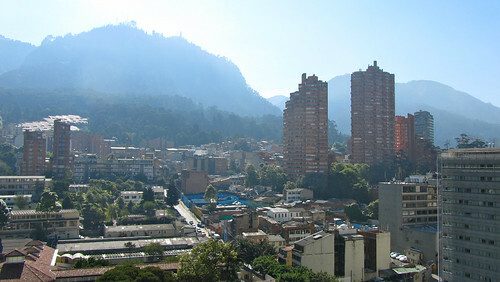 The city of Bogota abuts the mountains near there; they’ve built and built up the mountains slopes are too vertical to build anymore. It’s a really awesome sight, though. Found the address with no trouble and told the security guard we were looking for Seguros Suramericana. He indicated we should check in with reception. She kept telling us that she needed our documents, but when we asked her which documents, she just kept repeating “documentos” over and over until she eventually waved us on and told us a number that in no way translated to “16th floor.” But that’s what the instructions on Horizons Unlimited told us, so we figured we’d try there first. She wanted to sell us a year, but we explained that we were tourists and only wanted to buy one or three months (as those were the quantities we’d heard reports of buying). She had a hard time with that at first, but she went and asked her boss (the one man in the office) and he explained that she could do that, so she came back and asked for our customs paperwork, asked us if two months would be ok, since that’s how long we had in our passports, and then told us to go have a seat while she processed the insurance. We went and had a seat. 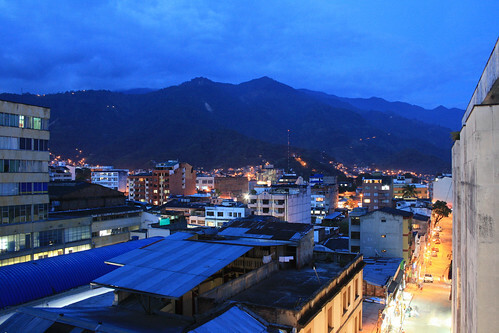 And admired the view of the city abutting the mountains from the 16th floor of Edificio Davivienda. And waited. And waited. And waited. About 50 minutes after we’d walked in the doors, the woman came over to us with some paperwork and indicated that it was time to see the cashier. Yay! During the waiting, I saw her on the phone several times and consulting with several other people in the office. Don’t know if she was processing our paperwork the entire time or if she was doing other stuff, but it seemed to be an unusual request and I wouldn’t be surprised if she was just having trouble with it. Paid the cashier with only some minor difficulties (i.e. we couldn’t understand the number and asked her to write it down for us, and then she had to run off to find change when we produced our bills) and we had our SOAT insurance papers! Yay! Kay did a “we have insurance!” dance and I had to stop myself from cheering and disturbing the whole office. 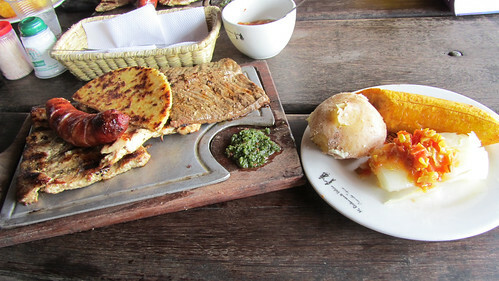 This was the final thing we needed to legally ride the bikes in Columbia, and therefore South America – and we had it! We and the bikes were free to ride in South America! At this point it was around 10AM and we hadn’t had breakfast yet, and we didn’t know how late our hotel served breakfast (which was included in our room cost, but we skipped it because we were anxious to get the insurance wrapped up) so we headed out of the building and found a convenient cafe nearby to grab breakfast. Got eggs with a variety of breads, a hot drink, orange juice, and hash browns. And when the menu said a variety of breads, we really got a variety of breads. They brought each of us a basket with various breads in them, including a lovely pastry type thing with DARK CHOCOLATE inside! Kay scarfed his down, and he’s not usually much of a chocolate fan, so I knew it had to be good. I went for mine only to discover that it was 3/4 empty of chocolate, so Kay squeezed out some of his. Yay for surprise chocolate! The restaurant also had WiFi, so we used WiFi on my iPhone to plot a map course to get us out of Bogota, since neither of us had the vaguest idea of how to get out of the city from our hotel. Grabbed a cab back to the hotel, which was much faster than when we went out, and quickly loaded the stuff onto the bikes and headed out. The front desk guy seemed interested in the bikes – he came out to watch us load up, and then back out of the garage and maneuver into the street. He kept commenting on how big our bikes are, and he seemed to understand that they were heavy – he mimed falling over at one point and what a PITA it would be to pick up, and we heartily agreed. Started the ponderous project of leaving Bogota at around 11:20AM. And surprisingly, with only one false turn which we quickly rectified when I realized we weren’t going the right way, we made it out of Bogota proper by around 12:30AM! Yay! We were riding in South America! Once we were out of the city, we found ourselves on twisty mountain roads. And it was beautiful. It reminded me of some of the riding we’d done in Costa Rica, but Kay said he liked it better than Costa Rica – something about the shape of the mountains really appealed to him. I was surprised to discover when I was reading our South America book that Bogota was located in the Andes – I always think of the Andes as being further down South America. The mountains we were riding through didn’t feel like what I expected the Andes to be. They were pointy at the top and had some deep valleys, but they were covered with trees. Not the Andes I imagined, but beautiful mountain riding. The only thing that marred it was the slow traffic. Lots of large trucks driving slowly down the windey mountain roads. Technically the speed limits on most of the road were 40 to 50KPH, but it felt like a 60-70 road to me and that’s what the rest of the traffic that wasn’t trucks was trying to do. Kay was riding in front, as usual, and I kept urging him to go around. Even when the trucks were already speeding. And even when we weren’t in a passing zone. He kept remarking “You’ve gone native, woman!” but I still maintain that I never suggested passing on a blind curve – only when it was safe. And the trucks were going SO SLOW! 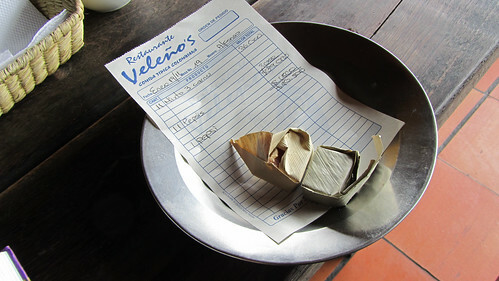 We stopped for lunch at a roadside restaurant just after La Mesa. It was after 1PM so we knew we should eat, but neither of us was particularly hungry after our late breakfast. However, they had meat on a stick, and there were a ton of cars there, so Kay suggested we follow our rule of stopping for meat on a stick and had a nice, tasty lunch. We each got the “three meats” plate, and realized too late that splitting one plate would have been enough for the two of us. I manfully ate all of my meat (chicken, beef, pork and chorizo), but couldn’t finish the yucca side, the plantain, or the piece of corn flatbread. Kay, meanwhile – the actual “man” of the two of us – couldn’t finish his meat and didn’t even eat his potato, let alone the rest of the sides. But it was tasty meat. Back on the road around 2:30 and we had descended over 1300 meters and the temperature had gone up again. Notably. In fact, it had gotten downright HOT. My temperature gauge was reading around 95 degrees and Kay’s (which is in Celsius) read higher than that. And unfortunately, we kept getting stuck behind the slow trucks again going around 40KPH so we weren’t getting any airflow and we were just hot. Did I mention hot? It was a big change from the 62 degrees of Bogota in the morning, or the 50 degrees while we were descending through the cloud cover on the drop down to La Mesa. On the way to the next town we encountered an oncoming bus passing a truck, probably over a double line, and heading straight for Kay. The bus didn’t seem interested in applying brakes, and wasn’t capable of speeding up enough to get by. Kay didn’t feel like making it easy for the bus as a matter of principle (“He shouldn’t be passing into oncoming traffic”), but eventually was forced to go to the side of the road. It wasn’t so much scary as frustrating, but the fates were with us and I caught it all on video. The next notable destination on the road was Giradot, after which we’d turn east-ish to get over to a road that led down to Cali. In this part of Colombia, there aren’t a lot of direct routes – you have to go over and around and sideways to get where you’re going. Made it through Giradot relatively quickly – maybe an hour or less from La Mesa, in spite of the fact that it was twice the distance from where we’d left Bogota. My map indicated that we’d continue on to Espinal where we’d catch up with 40 over to Ibagué, but shortly after Giradot, we saw signs for Espinal 10KM down the road, and Ibagué off to the right. That didn’t sound right. But they were signs for the next city on our route, so we followed them. Turns out the signs put us on a lovely four-lane divided highway. Which had to be new. There was practically nothing along the highway; we saw one gas station under construction (the sign was up but they were still working on the structure itself) and it was a lovely, fast ride. And surprisingly, from the highway, the view was beautiful. The mountains marched along off to our right, and soon we saw mountains ahead and to our left, too. A bit before Ibagué the highway ended (there was a sharp left and the highway itself continued straight for a bit but was blocked off and didn’t appear to be going anywhere in particular) and we were back on what I assume was the old route 40. Got into Ibagué at around 4:30 and both Kay and I agreed that we felt like we hadn’t been on the bikes long enough today, but we weren’t foolhardy enough to attempt a mountain crossing at 4:30 in the evening. 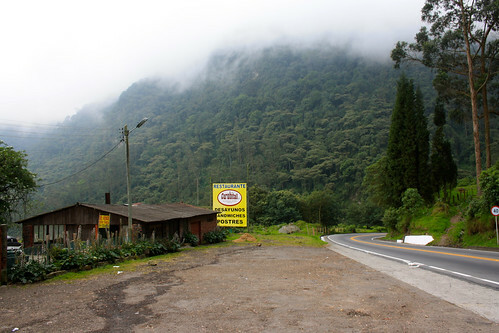 The South America book indicated we’d be crossing a very high pass on the road between Ibagué and Armenia (over 3600 meters) and seeing that we’d dropped in altitude significantly, that would have us climbing over a vertical mile between the two cities. We know better than to take a mountain road like that late in the evening (we’ve done it a couple of times – once in Mexico and once in Guatemala, and gotten stranded by darkness in little mountain towns both times) so in spite of the fact that we wanted to keep going, we started looking for a place to stay. Skipped the road leading to Armenia, and rode into Ibagué looking for a hotel. And rode. And rode. And didn’t see a hotel. We followed the signs that said “Centro” but they left us surprisingly without a clue in a place called “Sena” and we still hadn’t seen a hotel. We decided to turn around and head back toward the road to Armenia, and hope we’d pass a hotel there – but we saw a sign for a hotel on the right! We’d missed it before because the road was divided. We missed the turn itself, so we rode further until we could make a U-turn, rode back until we could make another U-turn, and this time we made it into the hotel. I could tell immediately when we pulled up that the hotel was out of our price range. It smelled too clean. Kay went in to check anyway, and apparently they kept coming down in price from about $210 but stopped at $100 US which is more than we’re willing to pay. 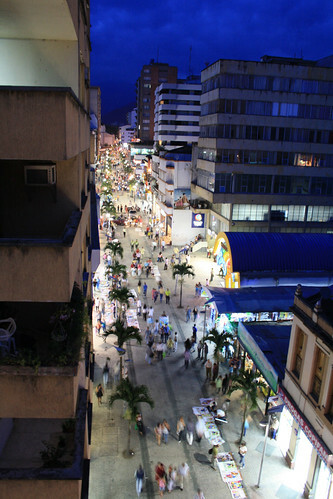 They did, however, suggest that we might ride into Ibagué centro to a hotel there that might be more economical. While we were debating whether Ibagué centro was actually the way the hotel told us to go, the concierge came out with a tourism map of Ibagué that had the hotel on it, as well as several others, and showed us how to go into town. We thought it seemed fairly easy so we headed off. Long story short, the map was very inaccurate and after much frustrating turning around and around on one-way streets, we finally found the hotel. Only to discover that it was also $100 US. Not very economical. They suggested yet another hotel that was down the road and around the corner for $40 US. Still high, but we were very overheated at this point and we’d been wandering around town for nearly an hour, so we just wanted someplace to stay. We got near the hotel and a guy came running out to tell us we needed to turn around and park at a drive we’d just passed, about 20 feet down the street before the hotel proper, which we couldn’t reach because it’s a one-way street. The other hotel had obviously called ahead. So we went down and had to do another series of ridiculous turns because they’re all one-way streets around here, so it took another 5-10 minutes to circle around to the parking lot. And once we’d parked, a guy came over and told us we needed to move the motorcycles – we couldn’t park there, and was horribly ambiguous as to where we *could* park them. We were hot and overheated but we moved the bikes and Kay went in to check on the hotel for us. 10 minutes later, he came back with a guy from the hotel to help us carry our stuff. Hauled everything back to the room (up some stairs into the hotel, and then up an old-fashioned elevator with a guy who has to operate it with a lever up to the 6th floor). Kay wanted to shower and change into clean clothes before we went out for dinner, but I didn’t have any clean clothes to change into – that’s one reason we were so keen to get to Cali, where we’ll stay for a day or two – so I went back out without showering and in my motorcycle pants and boots, still feeling hot and overheated. Wandered around until we found a decent restaurant, grabbed dinner, and Kay went to check on buying some pirated DVDs. He’s been talking about wanting to see movies lately (i.e. something would remind him of something he’d seen in a movie, and he’d say “I want to see X movie now” but we don’t have any movies with us and probably don’t have the bandwidth to watch any streaming from Netflix.) So Kay went to look for a pirated DVD table we’d seen, which wasn’t there anymore, but he spotted another one on the corner nearby and ended up buying Red and the newest Star Trek for $1.50 each. Walking back toward the hotel, we spotted another pirated movie guy and Kay bought Gulliver’s Travels and Tron for $1 each. We may decide that the quality is so poor we’ll just throw them away instead of watching them, but for $1 each, it was worth checking. And Kay is firmly of the opinion that one should bring a few favorite movies on a trip like this. Personally, I’m more a “favorite book” kinda gal – but movies require less work to look at after a long day of riding and spending an hour writing up a ride report, so video is definitely good. Did the obligatory “search for Diet Coke for Dachary” and found a supermercado (super market) a couple of blocks from our hotel that had a single bottle of Diet Coke in the fridge. I’m thinking it may be a bit more difficult to find here in South America. Then we headed back to the room, I showered and did some laundry, worked a bit, and then we wrote up ride reports for today and yesterday. And now it’s 10:30PM and we’ve been up and going since 7AM, and didn’t sleep well – and haven’t had any downtime. I still want a Dr. Who before bed but it’s late and I’m not sure we’ll have time. Riding the bikes every day is a joy and I feel really lucky to be able to do a trip like this, but it’s still nice to veg out and relax at the end of the day and we haven’t really had time to sit still since before the fan died on Kay’s bike in Costa Rica. We’ve been going pretty much constantly, all day, every day since then – snuck in a few episodes of Dr. Who but have generally been always researching stuff, doing stuff, or riding. I am VERY much looking forward to getting to Cali (tomorrow, if nothing goes wrong!) and relaxing for a day or two. I do have work to do for a client, but some relaxing is better than none at all. And hopefully we can wash our motorcycle gear while we’re there. It stinks so bad now that we’ve put it out on our balcony just to keep it from stinking up the room like it did last night. So yeah. Trips like this aren’t all glory. There’s stinky motorcycle gear (dear God, you don’t wanna smell the boots, but the jackets and pants are bad too) and too little relaxation, and legs and butts get sore after long stretches on the bike. But so far Colombia is beautiful and some of the riding on this trip has been glorious, so I definitely wouldn’t trade it for sitting on the nice comfy couch at home. Lack of clean laundry and abundance of nasty, stinky gear notwithstanding. * The address of the insurance company in Bogota is Seguros Suramericana, Carrera 10, #28-49, Edificio Davivienda, Tower A, 16th floor. The important part to give your cab is the Carrera 10, #28-49, Edificio Davivienda. The hours are 7:30AM to 12:30PM and 1:30PM to 5:30PM. Gorgeous! My favorite photos so far. Great trip I am so envious, but at least I get to live a bit through you guys and hope I can hit the road again soon. Obviously you all are computer savvy. How come you didn’t rip or bitorrent movies and load them to your harddrive and watch them on your computer with VLC or whatever. Better than cds. Heh, Tom – that’s a good question. But the truth is that we’re neither of us in favor of pirating movies or video. The TV episodes we’ve been watching have been purchased and downloaded through iTunes, and I think between the two of us we may own a handful of pirated DVDs but most of our collection at home is purchased in the legitimate way. (And, alas, there are far too many of them. That money could have been much better spent financing trips like this!) The only reason we bought these DVDs is because Kay really enjoys watching movies, and it’s a nice form of escapism and way to relax after long days on the road. As far as the going home part – we’re already talking about “the next trip.” This trip was never meant to be a one-off for us, and in spite of some of the less comfortable moments, there’s no question that there will be more. Going home will just be saving up money for the next one, whatever form that takes. (And spending time with our friends, who we miss and who we’re glad are following along here!) But we totally agree with the idea that traveling is something that never really stops. Hopefully you get to hit the road on a trip of your own soon!